Just wondering when we will see the first 2009 Ford SMB delivered? and who it might be?? Re: Who will be the 2009 Ford SMB Delivered ? WHAT? It's 2009? When did that happen??? Arent we supposed to see significant cab changes to the 2009 Ford? That will probably be me. Had a VERY difficult time finding a 2009 V10 RB Ford, but did. On its way to SWB West now for the 4x4. Then to Austin. McBeast has a driveway in the Dallas area that it likes to stop in from time to time. It will be nice to know another SMB calls the area home. Cool. I will be driving down there during the build out as well. We have a few open design issues that will have to be worked out on-the-fly. As for the 2009, they do have an updated dash/console/gauges that gave me warm fuzzies, so I scoured the US for one and paid a little extra. A little teaser photo......will be done with SMB's part in a few weeks, then forward to AV install and paint/wrap. 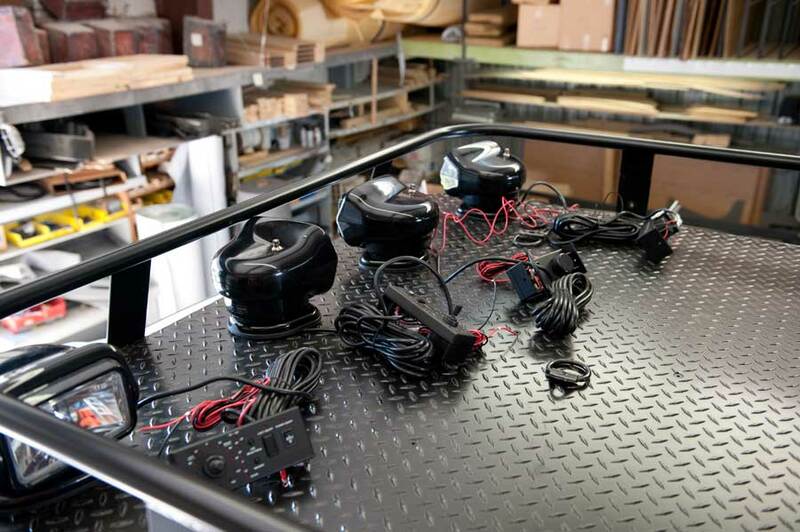 Those are custom HID GoLights with directional controllers. So I have a couple of weeks to run by and take a peek ? ?